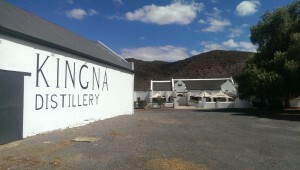 The Cape’s R62 Brandy Route houses some of the finest brandy micro distilleries in the country. In the world for that matter, I’m certain. Tucked away, some 12 km down an un-tarred road just past Montagu, lies a quaint and picturesque farm, that takes its name from the river running through this sleepy Klein Karoo town. Perfectly balanced with a sizeable well aged barn out front, and modern yet period farm house behind, Kingna is one of those places where time slips by unnoticed, stolen perhaps by the same angels that silently guard the maturing brandy barrels in the cellar. Kingna’s new 8yo brandy, not yet labled! Which turned out to be rather fortuitous for me on this visit, as Ruan had just that morning mixed up a bottle of his final 8 year old blend, set to become the flagship for now of the Kingna distillery. Not that the 5 year old is too shabby either, it’s first outing at Veritas in 2012 earned a it bronze medal, nothing to be ashamed of for an entirely self taught Hunlun. Which leads us to another story that gets his wry grin going. 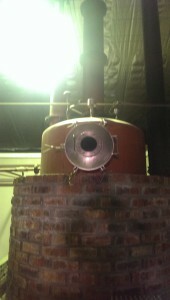 “It used to just be for fun, we had a potstill and made some brandy. A bit of witblitz and some mampoer too. Not for sale or anything, just for us to enjoy, you know?” He takes a breath as I sip the generous 5 year old potstill old he has poured for me. Which indecently has also been tweaked in recent years, and decidedly for the good too. Certainly better than the murder charges they figured would be accompanying such a dramatic police presence, but none the less a hard lesson to learn. And ultimately what pushed Ruan to take it to the next level. Using base wine purchased locally from the Montagu area, Ruan distills 40 thousand litres of base a year and carefully tucks it away in a mix of French and American oak barrels in his custom built storeroom. “American?”, I ask as we inhale the thick angels share that hangs in the air like a cloud of the finest perfume. 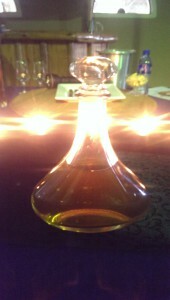 “It just adds a different dimension to the brandy. American gives more oak, chocolate and vanilla, adding a complexity you don’t always get from French”, he responds. After the cellar tour we return to the tasting room, candle lit at this point, as Eskom were having one of there all too regular moments. It’s time to taste the brand new 8 year old, handed to me in an as yet unmarked imported glass decanter. A premium packaging for a clearly premium pot still brandy. Layers of soft, smooth apricots welcome you, with subtle oak and telltale Karoo spice in support. The swallow is smooth and lingering, with the signature Kingna banana, sweet hints of vanilla and toffee. A stunning addition to the range and so great to see the reward of such tireless dedication to his craft paying dividends for Ruan. 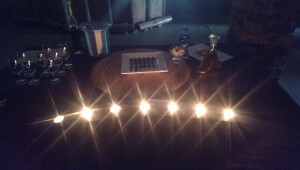 Tasting by candlelight. Thanks Eskom. Admittedly though, not easy dividends to cash in on, given the difficulty to market such gems that the small farms face. 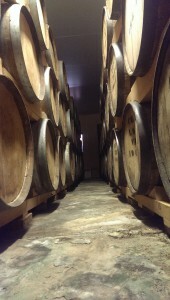 And a real pity too that these brandies are still sold for less than the dedication and skill to make them demands. But so long as Ruan and those like him keep producing such fine brandy, it certainly won’t be long until the small guys catch up and really recognise the heady fruits of their labour.